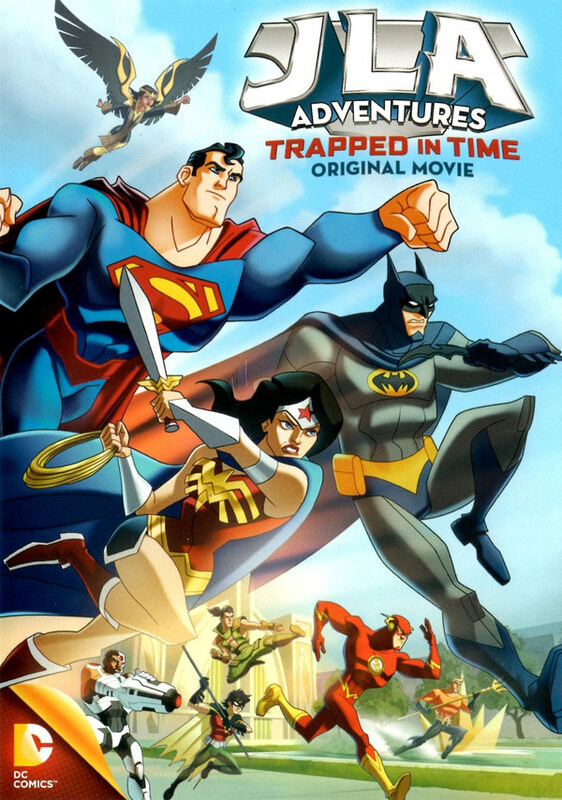 Part of some bizarre”stealth release,” JLA Adventures: Trapped in Time is a direct-to-video animated film available only in US brick-and-mortar Target stores released January 2014. Discovered by eagle-eyed fans who learned of the film through a Target store mailer roughly a week before its premier, absolutely no foreword was provided of the film be it an official announcement or from any of those involved making mention of it, its discovered existence largely a happy accident. 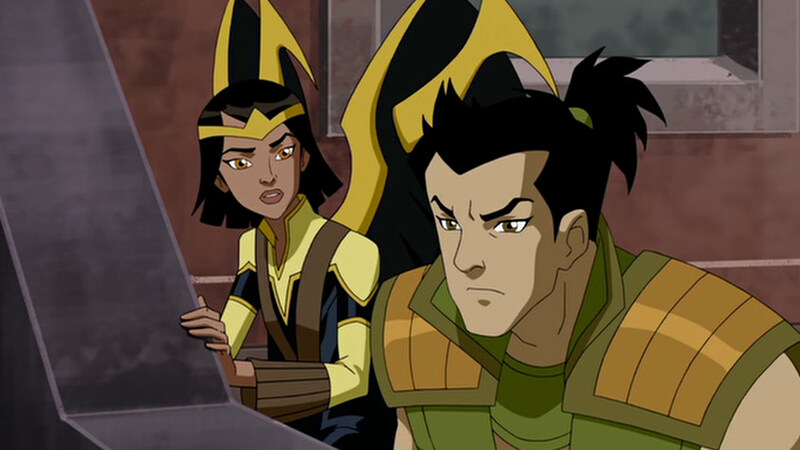 Even more strange, several of the players behind the hit animated series Avatar: The Last Airbender worked on the film but little mention of this fact has been played up by Warner Bros. In any event, the film’s plot features a quasi-team-up of the Super Friends and Legion of Super-Heroes when a plan by the Legion of Doom goes awry seeing the group’s leader Lex Luthor emerge in the future. Once there, he acquires the means to time travel while uncovering Superman’s secret origin and returns to the past to make sure Superman never came to exist. Following the rogue are Karate Kid and Dawnstar, two applicants for the Legion of Super-Heroes who are responsible for Luthor’s release and who alert the Justice League of America of the coming threat. First, lets examine some of the themes of the film. Wherein recent DC Comics animated film releases have leaned toward a mature audience, Trapped in Time is an obvious all-ages release (which has often been the kiss of death for many projects hoping to get off the ground for the direct market). Despite being made with children in mind, the number of nods and homages in the piece are meant to draw in older fans who remember Super Friends (especially Challenge of the Super Friends) and Justice League Unlimited (perhaps even Batman: The Brave and the Bold). The use of the Legion of Doom, for example, is the first big hint of this. 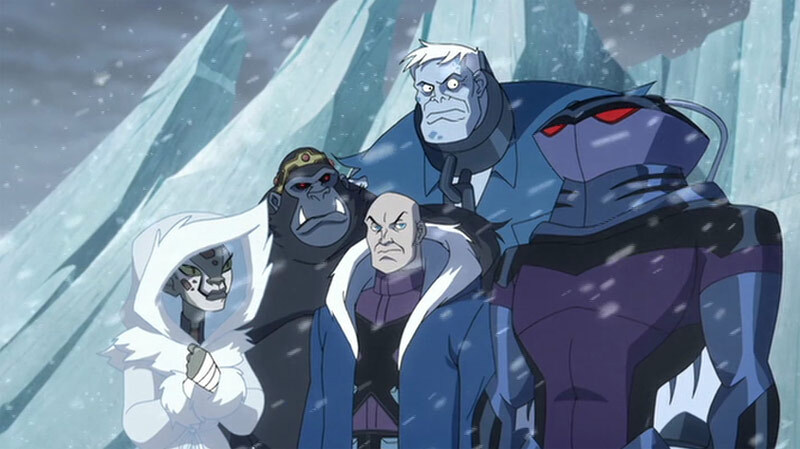 Paired down from thirteen members to eight (Brainiac, Giganta, Riddler, Scarecrow, and Sinestro absent), the group is very much the classic crew unlike a more recent appearance in Justice League: Doom. 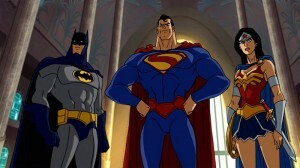 Further, they’re back to their old bag of tricks trying to conquer the world or extort money from its various nations with a plot based on the Challenge of the Super Friends episode “Secret Origins of the Super Friends” (where the Legion go back in time preventing Wonder Woman, Green Lantern, and Superman from becoming superheroes). As for the League itself, the bloated ranks of Challenge is reduced to simply Superman, Batman, Robin, Wonder Woman, Flash, Aquaman, and Cyborg. Karate Kid and Dawnstar, in addition to their base characters from the comics, seem to be homages to other Super Friends. Karate Kid is not only in a different costume, his outfit matches the color scheme of the hero Samurai (in fact, when I first saw the cover of the DVD, that was who I thought it was). A master of all martial arts, Karate Kid has the power to see weaknesses in anything (like Karnak from the Inhumans, though visually it heralds to the Byakugan, or White Eye, of the Hyuuga Clan from Naruto). Dawnstar seems to have elements of Hawkman (or JLU‘s Hawkgirl), Apache Chief, and Green Lantern (her tracking powers expanded to now include light powers with energy constructs, healing, and a radiant force, reminiscent of a cleric in Dungeons and Dragons so far as even invoking a deity). Robin initially believes Karate Kid and Dawnstar to be some sort of junior members of the Legion (which heralds back to the Super Foes in the Super Friends comic). Trapped in Time‘s opening even pays homage to the opening of Challenge and the movie has a brief cameo of Wendy, Marvin, and Wonder Dog. Time Trapper, Luthor’s avenue for manipulating time and arguably the nemesis of the Legion of Super-Heroes, had faced the Super Friends in their comic book series (albeit as the Time Master) and in the film seems to visually give a nod to the supervillain Time Commander. Admittedly, the plot of the film doesn’t stand up well to scrutiny. Lex Luthor is preserved in an iceberg not unlike Captain America who, upon being freed from the ice, manages to get up and walk around with little trouble. When Luthor’s plan to eradicate Superman comes to pass, the hero fades as does the Justice League while the Legion of Doom is completely unaffected (Luthor’s still a supervillain, Bizarro’s around despite never having Superman to be cloned from, the Legion of Doom is formed despite the group coming about directly due to the formation of the Justice League, and so on). Likely, these major plot holes are chalked up to the idea kids will be too dumb to notice these things. So, there’s an abundant amount of suspension of disbelief to even make it through the film without being yanked out of the experience. Despite this, the action is fairly good. The initial battle between the League and Legion is short but sweet, the fight between Karate Kid and Dawnstar with Robin was good but a bit long (Kid, who claims to have mastered all martial arts, couldn’t close the deal with Robin even when the former got serious), and Karate Kid taking on Captain Cold, Gorilla Grodd, and Black Manta was in my opinion the best battle in the piece (the film’s final battle feeling a bit rushed and lackluster). Character design wise, compliments of Lynell Forestall (DC Nation Black Lightning animated shorts), the film seems like a mash-up of the Total Justice toyline and Superman vs. The Elite. The animation was handled by Korean studio DR Movie, who worked on Avatar: The Last Airbender, which could explain similarities in action between the two products. By far, JLA Adventures: Trapped in Time is not a perfect film. Its length seemed short (despite being lengthened some ten minutes from conception to completion), the finale felt rushed (very deus ex machina in the vein of Super Friends), and the character design and animation left something to be desired, but it wasn’t bad. While I don’t subscribe to the idea of dumbing down material to play to children, nonetheless the film was something kids and adults could sit down and watch together. Despite its “stealth release,” the film seems to have sold well enough that it was announced the DVD will be released everywhere in a few months (as the film ended on a cliffhanger, it also leaves the door open for a direct sequel), so it would appear to have exceeded expectations. Speaking of the idea of a stealth release, I could only speculate it was felt there was little confidence in the product performing well so its expansion maybe a small victory for those looking for more all ages material coming out of DC Comics’ animated releases (though, the film could have also been intended as a tie-in akin to Ciro Nieli’s DC Super Friends: The Joker’s Playhouse for an exclusive Target toyline that fell through which means a sequel has little hope of emerging). 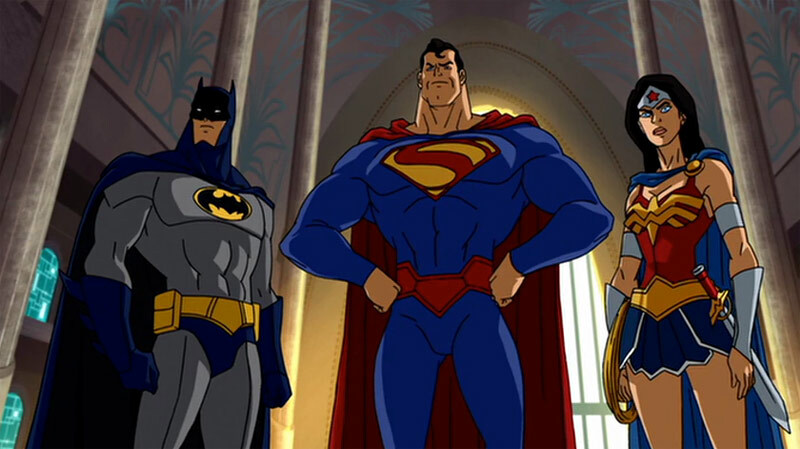 Further, despite Green Lantern being absent from the film, many of the people behind Trapped in Time also come from Green Lantern: The Animated Series so support from fans of that series could push for a sequel (the film’s director Giancarlo Volpe, having produced GL: TAS, has joked in his mind Green Lantern was busy with the events of that series’ finale). If you’re a fan of Super Friends, Avatar: The Last Airbender, or Green Lantern: The Animated Series, you’ll probably enjoy Trapped in Time. If you’re looking for a superhero fighting supervillain story, this movie is for you. If you’re looking for Young Justice, Justice League Unlimited, or more of DC’s typical direct-to-video fare, you will be disappointed. The Return of Megas XLR?